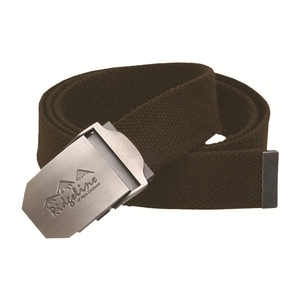 Ridgeline Webbing Belt in brown. 130cm - cut down to fit. Needed cutting to size. Robust outdoor belt. A super belt in fact I have bought 2. Does not need holes punched in them if you lose weight. Just what I needed a strong reliable belt with very nice buckle. Top quality belt, heavy duty webbing and solid metal buckle, this belt is made to last a lifetime. Belt material is very tough, 3.5mm thick, and buckle is no piece of stamped-out tin. This buckle could possibly hold a suspension bridge. Exceptional value.&nbsp;This is the third item of Ridgeline kit I have bought, and all are very good quality and value.&nbsp;Also arrived within 48 hrs and delivery notified to a 1 hour slot. Very convenient. Very secure locking clasp which is beautifully designed in solid brushed aluminium with the Ridgeline logo.&nbsp;If you want something to hold your trousers up this is it and for &pound;9 for a quality well made item you cannot walk away from a bargain like this - greatly impressed by other Ridgeline products too.&nbsp;I may have been partially responsible for this item being out of stock for a while, I bought two- nuff said.